Dr. Shaila Gowda received her medical degree from Kasturba Medical College and completed her neurology residency at the University Medical Center in Jackson, Mississippi. She went on to complete a fellowship in epilepsy and clinical neurophysiology at the Cleveland Clinic Foundation in Cleveland, Ohio. Dr. Gowda is board certified in neurology and specializes in neurology and clinical neurophysiology, with a special clinical interest in epilepsy. 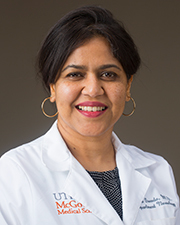 An Assistant Professor in the department of Neurology at McGovern Medical School at The University of Texas Health Science Center at Houston (UTHealth) and also sees patients at UT Physicians Neurology – Texas Medical Center and UT Physicians at Sienna Village in Missouri City, Texas. Prior to joining UTHealth, Dr. Gowda held various staff and teaching positions at South Texas Veterans Health Care System in San Antonio, Texas; Beaumont Health System in Royal Oak, Michigan; Providence Hospital/St. John Health System in Southfield, Michigan; and Metro Health Medical Center in Cleveland, Ohio. Throughout her career, Dr. Gowda has co-authored numerous articles published in medical journals, and has participated in several research studies on topics relating to epilepsy.